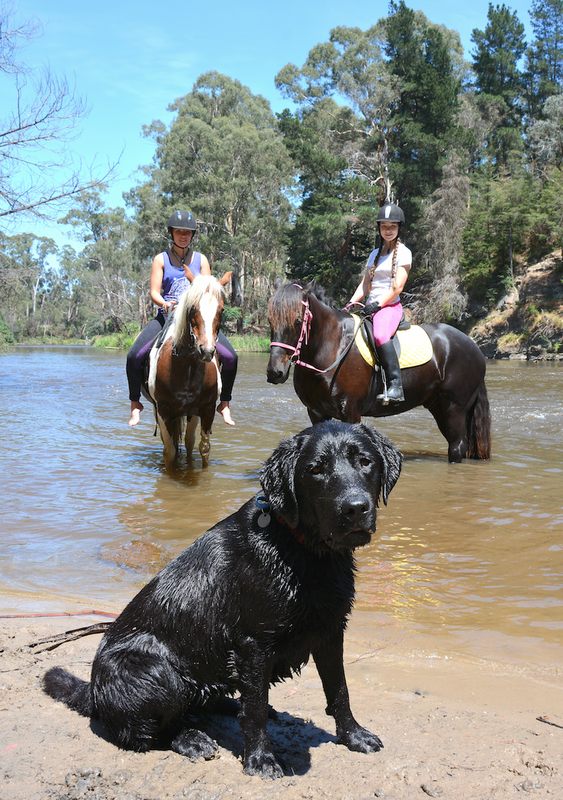 WARRANDYTE horse riders are urging dog owners to abide by on leash areas along the Warrandyte River Trail following aggressive attacks on horses. Those who ride their horses and ponies along the scenic trail believe most dog owners are cautious and friendly, but say a small percentage of dog owners are putting riders and horses at risk of injury by not doing the right thing. “Most dogs are fine but usually the most aggressive dogs have never seen a horse before,” Warrandyte rider Jane Sutherland said. “Then there are owners who don’t abide by the on leash area signs. “A couple of weeks ago my horse was chased by two dogs off lead. They tried to bite my horse’s leg and my friend, who was riding my horse at the time, asked the owner of the dogs to put them on lead because it wasn’t an off lead area. In another recent incident along the trail a dog tried to bite a pony’s throat and another horse’s back legs, landing the owner a $2500 vet bill. Jane says most dogs using the trail are friendly with horses. Jane estimates 50 riders use the trail each week. However, horses won’t be able to use the trail for much longer. Manningham council chief executive Joe Carbone says the Warrandyte River Trail is expected to be closed to horses in a year when another horse trail is complete. “Council is working on an alternate horse trail along Gold Memorial Rd through Warrandyte State Park and ending at Ringwood-Warrandyte Rd,” Mr Carbone said. Removing horses from the Warrandyte River Trail was a recommendation of Council’s Warrandyte River Reserve Management Plan, following two dog attacks on horses in 2012. However, Lauren, 19, and Eliza, 16, have been riding their horses along the trail since they were eight years old and say it would be upsetting if they could no longer bring their horses along the trail to exercise and swim in the river. “It would be a major loss for the whole community, not just us,” Lauren said. Jane says many trails around Warrandyte Park have already been closed to horses, mostly due to environmental reasons. She says the closure of a small trail near Tindals Rd, which many riders rode along to get to pony club, is just one example of how riders are being forced onto roads with potentially life threatening consequences for horses, riders and motorists. “A couple of months ago a group of kids were riding back from pony club along the side of Tindals Rd and there was a guy on a motorbike flying up Tindals Rd,” Jane said. “A girl, who was 12 years old, put her hand up to ask him to slow down but instead he deliberately sped up, went as close to her as he could and the horse freaked. She fell off and the horse was running up Tindals Rd without a rider. JUST as Warrandytians gear up for another festive season, the McMullen family has something extra to cheer about this Christmas. For this one will be the 10th Christmas that 12-year-old Isaac McMullen can hear the sound of tearing wrapping paper, can sing along to Christmas carols and listen to his family chatter over the dinner table. Isaac is profoundly deaf and without his hearing aid and cochlear implant can only hear sounds as loud as a chainsaw or an aeroplane taking off. “Isaac was first diagnosed on Christmas Eve 2002, so it went from being the worst Christmas ever, completely ruined, to just the happiest time when he was implanted, started speaking and could hear Christmas songs two years later,” his mother Mel told the Diary. Mel first suspected Isaac was deaf after he slept peacefully through the loud noise of an industrial vacuum cleaner as a baby. A worker at an early childhood centre told her she was just being paranoid, but after months of closely monitoring her son’s reactions as she intentionally dropped pots and pans around the house, she took Isaac in for an audiogram. His parents, determined for Isaac to have the same opportunities as every other child, had to fight long and hard to secure funding for his expensive implant, which costs thousands of dollars. Mel successfully appealed the decision with the help of Professor Graeme Clark, the man responsible for the pioneering research and development of the bionic ear. His work has brought hearing to more than 200,000 people across the world. Mel’s great aunt, Gwen, who coincidentally had taught deaf children her entire life, also encouraged her to not give up. Gwen lived in Warrandyte and was passionate about educating deaf children and she made Mel promise that she would keep fighting for Isaac’s implant. “After seeing Isaac’s audiogram she burst into tears and she told me ‘get him implanted, you get this child to speak, do it for me’,” Mel said. Isaac now hears normally with his implant and hearing aid, which even has a waterproof cover, allowing him to go swimming with his three brothers. His family says moving to Warrandyte has been one of the best things for Isaac because he gets to listen to the sounds of cockatoos, king parrots and rainbow lorikeets around their house every day. Isaac is also doing extremely well in school at Ringwood North Primary, where his favourite subject is art. A keen listener of music, he also plays the violin and the piano. While it’s difficult for people with implants to perfectly mimic music, Isaac’s hearing has developed so well that he’s now starting to correct the sound as he plays sharps and flats on the violin. “I’m really grateful for the implant because life without it would be sad, like black and white, no colour,” Isaac told the Diary. As the first baby to receive a cochlear implant at the Melbourne Royal Children’s Hospital, Isaac has been credited with helping change some of the perceptions surrounding hearing impairment and deafness. Earlier this year he travelled to Canberra where he gave a speech in front of the nation’s politicians about how his cochlear implant had transformed his life. And after the New Year, Isaac will begin high school at Donvale Christian College. “He will be one of the first profoundly deaf kids to go to a mainstream primary and secondary school, as far as we’re aware,” Mel said. WARRANDYTE has again trumped all other suburbs in Manningham after H2Pro Plumbing was named Business of the Year at the Manningham Business Excellence Awards last month. The victory follows hot on the heels of Quinton’s IGA claiming the title last year. Twenty-five businesses were nominated for this year’s Manningham Excellence Awards, with categories including hospitality, innovation, retail and professional services. The awards recognise and celebrate businesses that have introduced a new process or improved an idea, method, technology, process or application resulting in improved business profitability and or social benefit. H2Pro’s Tristan Wise, who does a lot of the behind the scenes work for the business, says winning was a “momentous” achievement. “We didn’t think that we would actually win our category of Professional Services let alone Business of the Year. We feel extremely humble,” she said. H2Pro started 14 years ago and is known for giving back to the community. This year it has donated to various local fundraisers, organised educational presentations about bathroom trends and kitchen design, and has supported Melbourne-based charity Who Gives A Crap. people will also choose to support the cause. Tristan says she’s proud of how far the business has come since it was first established in 2000 and hopes H2Pro’s win inspires other small businesses around Warrandyte to enter next year’s awards. “At H2Pro we are a merry band of three, Tony, director/plumber, John another star plumber, and myself behind the scenes,” she said. NOTICED the hike in electricity bills and the confusing world of solar? The Diary’s DAVID HOGG offers a comprehensive analysis of the current state of play and proves there are ways you can save and reduce your bills. A COUPLE of years ago, WarrandyteCAN conducted a major initiative to attempt to get an electricity retailer to provide competitive pricing for Warrandyte residents. Alas, the task was too difficult and has become even more so since then, with new retailers springing up and a price war that is centred around how big a discount they’ll give you rather than on the bottom-line price you’ll pay. The discount means nothing unless you know the price. The newer retailers tend to come in with low prices to corner the market, then raise them considerably during or after the first year. At that same time they introduce a new product that is still competitive, but leaving their existing customers stuck on the old and now-expensive product. So, last year’s bargain is not necessarily this year’s continuing good price. As with car and house insurance, it really pays to shop around every year. Few can be bothered to do this. Perhaps the biggest killer in your electricity bill is the so-called service or supply charge which can vary between retailers from $1 to $1.50 per day, which means you can be paying over $500 a year before you’ve consumed any electricity at all. The other charges relate to the electricity you actually use. Most Warrandyte residents will by now have smart meters. These are now read online and are available for you to read online through the portal at myhomeenergy.com.au. The best tariff, which hopefully most readers are on, is the “Time of Use” also known as “Peak/Off-Peak” tariff. This provides for peak time electricity at anywhere between 25 and 45 cents per kilowatt hour, and offpeak rates from 12 to 20 cents. The peak tariff applies between 7am and 11pm AEST weekdays only, so your weekend electricity is at a much cheaper rate. Note, however, that your meter does not know Daylight Saving, so currently the cheap rate runs from midnight to 8am. Nearly all retailers offer a discount, but again beware: with some retailers the discount applies only to the consumption but not to the service charge, whereas with others it applies to the whole bill. Most retailers give the discount off the bill in question, but a few treat it as a discount for prompt payment and apply it to the next bill. With the latter, you’ll find it difficult to get the last discount back if you change retailers. I have developed a spreadsheet with the latest tariffs, discounts and billing methods for each supplier and it is interesting to note the differences in prices. indicated in the table below left. Looking at this table, you may consider changing retailers; but there are pitfalls. Even though our meters are no longer “read” by a meter reader, Ausnet Services (previously SP-Ausnet) still use a notional “date of next meter reading” at three-monthly intervals, and your change of retailer does not take effect until the next quarterly date. Add to this a couple of weeks for paperwork to progress through the system, and a further 10-day cooling-off period, and it can be anything from one to four months before you will actually change. By then, the prices may have changed again. This is a volatile market. It may also be worth researching whether your prospective new supplier’s customer service desk speaks a language you understand. Some retailers may lock you into a two or three year contract. This is not a problem as the fees for breaking the contract are small, usually in the range of $20 to $40. If your retailer is one of those in the bottom half of the table, or if your bill is considerably higher than in the table, ring them and tell them you’re considering changing supplier. Ask if you’re on their best plan and suggest that they offer you a better deal. They may well do this. Your retailer may give you a slightly bigger discount if you elect to pay automatically by credit card or direct debit, or if you elect to receive your bills by email, or if you are an RACV member. If you are a concession card holder, tell your retailer and you’ll get a useful government rebate. If your washing machine, clothes dryer or dishwasher has a “delayed start” function, consider running it after midnight or before 7am during the week. If you have a pool pump, put it on a timer and operate it at night for filtering. Do not be persuaded to change to a “Flexible Pricing” tariff in which you have three rates – Peak, Shoulder and Off-peak – with some seasonal variations and differences at the weekend, unless you have really researched your usage. I have yet found an instance where “Flexible Pricing” would be cheaper than “Peak/Off- Peak” in a residential situation. Think very carefully before you consider putting in solar panels; you’ve missed the boat. They’re paying you 6.2 cents for the electricity you sell them and charging you 18c at night and 30c or more during the day to buy it. It will cost you $6000 to $10,000 for a 4kW system installed, and you’ll be saving some $400 to $600 per year in bills at current rates with no guarantee of future pricing, making a 10 to 18-year payback period. For concession card holders, there are two Victorian government concessions that apply. These have both been quietly watered down in the past 18 months. The “Annual Electricity Concession” now gives you 17.5% discount off the consumption and service components of your bill after discounts have been applied and any solar credits deducted, and excluding the first $171.60 (the Carbon Price Threshold) of billing in any year. The “Service to Property Concession” is only good for grey nomads or those who are away from their property for most of a billing period, and pegs the service charge for that bill to be no more than the consumption charge. Now we’ll look at the rates for those with solar panels, and here is a right old muddle. Those people with foresight who installed their panels before 2012 receive the premium feed-in tariff (PFIT) for electricity they export to the grid at the rate of 60c per kWh guaranteed until November 1, 2024. Those who installed panels in 2012 receive the transitional feed-in tariff (TFIT) at 25c per kWh until the end of 2016. Those who installed after 2012 would have benefitted from the falling price of purchase and installation, but get bugger all for their electricity export, currently 8c per kWh (FIT) dropping to 6.2c from January 1 next year. Some retailers claim that they “top up” the government rates by an extra 6 to 10 cents, but often this is a smokescreen. The catch used to be that you get the promised discount off the whole bill, “not just the consumption like other retailers but with us, madam, it’s off the whole bill so it includes the service charge as well”. Yes, but what he fails to tell you is that the “whole bill” also includes your solar credit which they’ll deduct before they apply the discount, so you’re not getting the implied benefits at all. Recently they’ve changed tack. The latest scam is that the discount plan offered by some retailers (three at the current count) in advertisements does not apply to customers with solar power; they get a very reduced discount on their consumption or none at all. I have run the spreadsheet again for those with solar export. Again it makes various assumptions – that you own a 4kW solar system, it generates 5300kWh per year of which 1800 is used in the home and 3500 exported to the grid, you purchase 1817 kWh peak and 3000 off-peak from your retailer, and other assumptions as before. 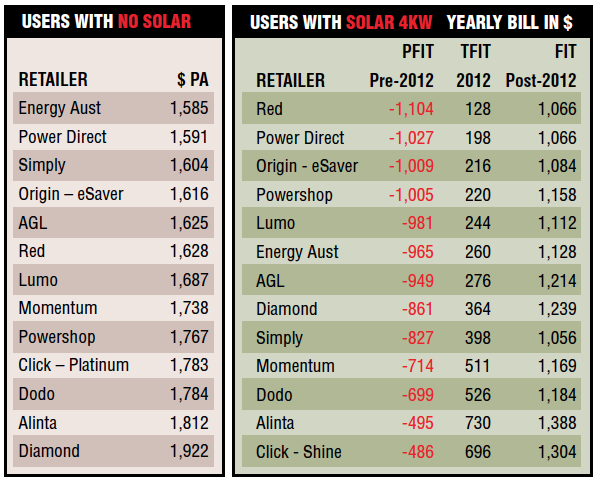 Then at January 2015 your annual total electricity bill would be with each retailer in the table below right. Most of the tips for non-solar users above apply. If you are on the PFIT or TFIT, try to run as much as possible at night or weekends. It’s better to export during the day and get paid 60c or 25c and then buy it back at night at 18c. The reverse will apply when your tariff expires at the end of 2024 or 2016 respectively; then you’ll be better using your solar to power the house during the day If it’s not in the fine print, check whether they are giving you the promised discount on everything you buy from them, or whether they are deducting your export refund first. Check that the discount you expected actually applies if you have solar. Finally, remember that this is a rapidly changing market, and that prices and tips quoted here can be out of date very soon. It pays to compare prices annually. WARRANDYTE Diary was a proud finalist in six out of nine independently judged categories at the annual Community Newspaper Association of Victoria awards recently. Living up to its motto of “for the community, by the community”, the Diary received a notable thumbs-up, winning the award for Best Community Content among others. Seven newspapers were short-listed for this award, with three finalists selected against strict criteria: ownership; whether there was an invitation for community people to write; writers being named; variety of writers; type of content about community; whether the writing style seemed community or corporate based. The Diary was also recognised for: Best Layout & Design (winner); Best Photo (finalist); Best Sports Coverage (finalist); Best News Feature (finalist), and the jewel in the crown – Best Newspaper (winner). “I was won over by this newspaper’s excellent understanding of its local community. It has a superb lay out with headings and sub-heads that perfectly fill the space, lots of good quality photographs and there is an abundance of life and colour in this 40-page paper. “There’s a good mix of hard and soft news plus stacks of wonderful feature stories – everything from Australia’s most remarkable school through to a Warrandyte doctor talking about a birth drug breakthrough on the world stage and a well written and photographed feature by Bill McAuley about a local living treasure, Hugh McSpedden. Diary editor Scott Podmore described the win in last month’s edition as “a fantastic result, not only for our great little team, but all our contributors and the Warrandyte community that we serve”. 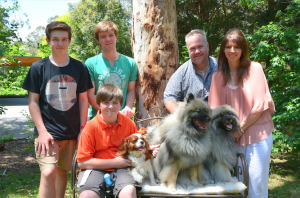 Warrandyte Diary is one of more than 200 community newspapers regularly published in Victoria. CNAV, the peak body that represents them, actively works with its members to enhance the capacity and standing of community newspapers in Victoria, and also seeks to raise their profile with all levels of government. To advance its aim of fostering communication between the papers, the organisation hosts an annual conference, which administers the CNAV awards. Financed solely through advertising, Warrandyte Diary at 44 years old is the longest continuously running community newspaper in Victoria.